“Hitting the marathon wall” is a much-feared and much-discussed phenomenon in marathoning. Runners speak ominously about a sudden wave of fatigue that sets in at about 20 miles into a marathon. At this point, they say, the race is half over. Contending with the wall is a problem whether you’re an elite runner or recreational jogger. Understanding where the wall comes from is one thing, but predicting it and determining how to overcome it is a bit more challenging. Today, we’ll take a look at the efforts of one researcher to develop a mathematical model which can predict whether you’ll hit the wall in your next marathon, and where exactly you’ll hit it. 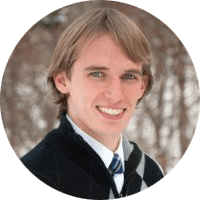 The researcher, Benjamin Rapoport, is an MD-PhD candidate at Harvard and MIT. In 2010, he published a paper which described his model for tracking the energy consumption of a marathon runner. The premise of Rapoport’s model is fairly simple: it takes a certain amount of energy per mile and per pound of body weight to move a runner from point A to point B. Converting to metric, this amount is conveniently about one calorie (as in food calories) per kilogram of body mass per kilometer of running. This would mean a 150-pound runner requires around 110 calories per mile, regardless of pace. In Rapoport’s model, the per-mile energy expenditure of runners doesn’t vary based on the speed they run, but where they get their energy from does. Though runners mostly think about carbohydrates as their principle energy source, a significant portion of your energy expenditure while running a marathon comes from fat. At easy paces, you burn more fat; as you run faster, your body begins to rely more heavily on carbohydrates. So, on a typical easy run, you might be burning 60% carbs and 40% fat. But in a 5k race, well over 90% of your energy is going to be coming from carbs—you just can’t burn fat quickly enough to produce enough energy to run 5k pace. Keep in mind that hitting the wall happens when you run out of carbs (your fat supply is effectively unlimited), so to predict if and when this will happen, we need to know how fast you’re running. The final variable in the mathematical model estimates how much energy you have stored up in your body in the form of carbohydrates. There are two sources for your body to access carbs when you run: carbs stored in your liver, and carbs stored in your leg muscles. According to Rapoport, the size and energy density of the liver are tightly regulated by the body, so this amount is only dependent on your body mass (as the liver makes up about 2.5% of your weight). The energy stored in your leg muscles also depends on your body mass, but also the size of your legs and the density of carbohydrates stored in them. Rapoport provides a range of typical values for each of these: for most people, leg muscles make up about 21% of their body mass, and a typical runner stores about 36 calories worth of carbs per pound of muscle. By doing some simple algebra, we can create an equation to calculate how far you can run before you expend all of your carbohydrate energy and hence hit the wall. Once you’ve used up your energy stores in your liver and your legs, you can go no further—at least, not without a massive shift in carbohydrate consumption and likely a massive drop in speed as well. Rapoport’s model is best displayed as a graph, reproduced below. The only inputs you need to figure out are the relative speed you intend to run your marathon at, expressed as a percentage of your VO2 max, and the amount of carbs stored up in your leg muscles. Surprisingly, body weight doesn’t factor into the final result: although heavier runners require more energy to cover a given distance, they also (at least in this model!) have more carbohydrates stored up in their body. Figuring out your pace as a percent of your VO2 max sounds tricky, but it’s not too hard. We can use your pace in an all-out two-mile race as a pretty good estimate of your VO2 max pace, then figure out your marathon pace as a percent. Haven’t run the two-mile since high school? Multiply your 5k time, in minutes, by 0.63 to get an estimate of what you can run for two miles. An 25:00 5k multiplied by 0.63 gives us about 15:57 for two miles, or 7:39 mile pace—that’s your VO2 max speed. Dividing your VO2 max pace by your goal marathon pace (9:00 per mile) tells us the relative intensity you’ll be running at. In this case, it’s 0.83, or 83% of your VO2 max. According to the scientific literature, most people are able to run a marathon at 60-85% of their VO2 max. Elites and experienced runners tend to be on the higher end of this scale, and less experienced runners tend to be on the lower end. A generous estimate, which uses carb storage values from “carbo-loaded” athletes who have consumed a lot of carbs before their event. With this information, we can predict a range of points when you’ll hit the wall. In the graph above, the red curve depicts the conservative estimate, the orange curve depicts the typical estimate, and the green curve depicts the generous or “carbo-loaded” estimate. The gray shaded region represents the typical range of speeds that marathoners can maintain for the duration of the race—60-85% of their VO2 max. 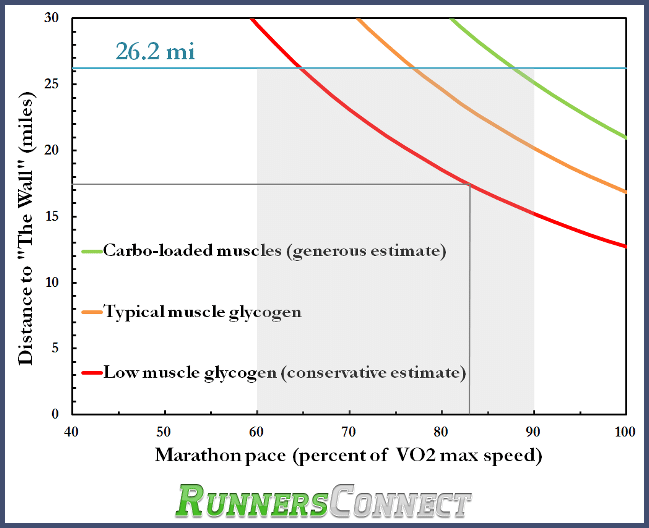 Once we know what percentage of VO2 max pace we wish to run at for our marathon, we can draw a vertical line to each curve to determine where we’ll hit the wall in each scenario. In our example from earlier of the 25:00 5k runner shooting for a 3:55 marathon, we know that he’s going to be running at 83% of VO2 max. In this case, drawing a vertical line (marked on the graph in dark gray) up from 83% of VO2 max pace shows that, in the conservative scenario, our runner will hit the wall at a bit over 17 miles into the race. If his muscle energy stores are more in line with that of a trained athlete, he could make it all the way to 23 miles before he hits the wall. And if he’s done some carbo-loading in the days before the race and has above-average carbohydrate storage in his leg muscles, he could make it all the way to the finish without hitting the wall. Rapoport concludes his study with a few words of caution: this model is a simplistic one, and glosses over some important details. To name just one, this model assumes that all runners have about the same amount of muscle mass in terms of percentage of their body weight—something that isn’t true in the real world! Rapoport calculates that the uncertainty associated with his model should be around 5-10%, meaning our predicted “wall” timings could be off by one or two miles. Considering this, it’s best to use the conservative estimate—the red line—as a starting point for planning out your next marathon race. Also keep in mind that even this conservative estimate might be off by a mile or two. So, you’ve done the math, checked the chart, and found out that you’re probably going to hit the wall in your next marathon. But what can you do about it—how do you figure out how much carbs to take and when to take them? That’s what we’ll look at next time! 2. Maughan, R. J.; Leiper, J. B., Aerobic capacity and fractional utilisation of aerobic capacity in elite and non-elite male and female marathon runners. European Journal of Applied Physiology and Occupational Physiology 1983, 52 (1), 80-87. 3. Daniels, J., Daniels' Running Formula. 2 ed. ; Human Kinetics: 2005. Great article and tool. I’ve been trying to work out soemthing like this prior to my last few races and never felt like I had it quite right. The article helped answer some of my questions and the spreadsheet is a great resource. Great post! Thanks, Gary. We’ve got a followup next week that explains the fueling part of the calculator. Should be another awesome resource. Best of luck with your training! Pretty good articles you are having, which I read with interest every now and then (i.e. when time allows, between home, work, running and all the rest…). Still have a few on the list to read. To skip the warning I would have to get my 5K…1min20sec faster than what I do currently… (which is not directly feasible I think at this moment…). SO, I think I keep on my training program, knowing I have (apparently) super powers (?) allowing me to do the unrealistic. (and yes, I will probably continue to strive going down in my marathon time as well as shorter distances as well, independently of what the calculator says…). Thanks for the input, Kari. The reason for this is that the 5k is not a realistic or accurate time for you. As you mentioned, it was during a workout and you were in marathon training. This means it wasn’t a real “race” and thus not an accurate representation of your fitness. I think if you were to train for and race a 5k specifically you’d find the times line up well. Jeff – Thanks so much for this article and the calculator. In two previous marathons and one water-only long run I hit the wall right at the point predicted by the calculator. I did not have a plan in the marathons for fuel and I did not know it was necessary in the long run. Your calculator gives me an exact fuel plan for my next marathon on September 13th. Thanks! Thanks! Thanks!! Unlike vapour, smoke lingers leaving a highly recognisable smell. want to breath without difficulty and they are confused with what to use. Modern-day research suggests that it may also be effective when treating cold, flu and congestive bronchial ailments. excellent article !!! What I could not figure out so far is the differences in percentage of energy from fat burning between an untrained person and a trained person. Or in other words: by how much can I increase my fat burning capacity e.g. by doing long runs? The app. 2000kcal of carbohydrates stored in the body and the 200-300 kcal per hour a person can maximum absorb leaves only the amount of energy from fat to run a faster marathon. If not, here is another post on the science behind fueling for the marathon that you may enjoy. Hope this helps! I can then calculate how much the calories is stored in the leg muscles, but I cannot find how to calculate how much calories stored in the liver. Am I missing anything?